J.K.: The book you have presented us with today is essentially a parody of all of our known myths. What is the role of humor and satire in your life? Augustus Corto: A redeemer! I use humor as my mother taught me to - as a defense mechanism, as a lasting mockery of tragic situations both personal and larger than me. With any of my abilities, I also serve humorous storytelling, which I love very much. I very much like to read (such) authors, although unfortunately not many exist in Modern Greek literature. The only book that in recent years I have really enjoyed and it was purely humoristic is the amazing series of Gabriel N. Pentzikis, son of Nicholas Pentzikis, Byzantium has the day off, a masterful book. 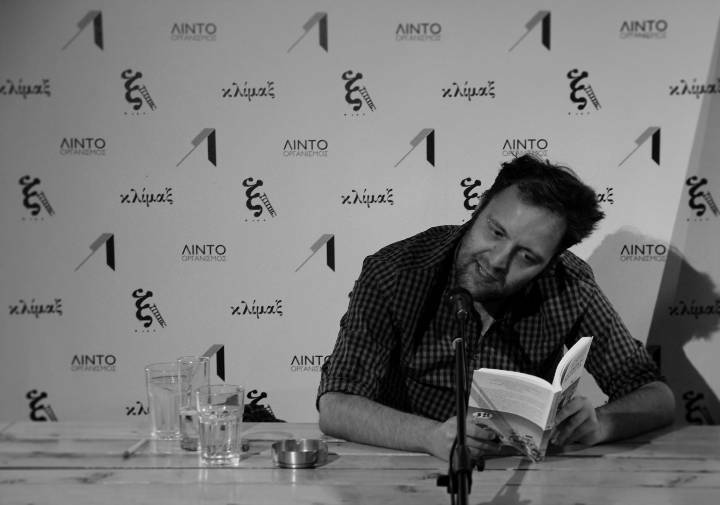 Since then I seek it to foreign writers and generally in any author that makes me laugh and of course to my custody, to Tsiforos, whom I always keep scattered in different shelves. J.K.: In your book you have incorporated elements of the Modern Greek culture. Which are those that the reader will distinguish reading your book? Augustus Corto: I think anyone who has lived in Greece in the past 30-40 years will recognize several of people’s misfortunes translated to the gods, the semi gods, the heroes. Moreover, as I am opposed to the view that language must be pure and immaculate, and to the purists who are constantly afraid of new features, new scripts or Greeklish even, I use colloquial language and its idioms extensively. I am not afraid of Greeklish; I believe that Zeus would be the absolute “player” in Facebook, sending misspelled messages in Greeklish. Language is a living organism that is constantly evolving - it neither suffers nor dies, and not only it isn’t strange to me but it’s my main tool. J.K.: How did your cooperation with Arkas come up? This is your third book cover that he has illustrated. Augustus Corto: It was a great gift from Arkas. The fact that he trusted me with his favorite projects and characters for my books and that I have been able to coexist even in this minor way with our most important living comedian is for me an honor that I don’t know how and if I will ever be able to repay. J.K.: You very often express yourself through the social media (Facebook). Is this a trending habit for you or a need just like writing? Augustus Corto: Facebook tends to swallow the Internet. Informational sites, sites of literary interest, of scientific interest which we would search for, now have a profile on Facebook which you follow and get informed through it. It is so user-friendly... In the past we were depended on press releases, posters and advertisements so as to organize an event like today's book presentation. Now, you create an event on Facebook and you can more easily inform the people who are interested. It’s a very useful and ideal tool for people like me, who have a routine somewhat lonely, because that is the nature of our work or because that’s our personality, which however through Facebook and the rest of the social media we are able to interact and coexist in a way sometimes lighthearted, sometimes of deep concern and with our fellows and friends who are expatriates. Whatever brings people together-even a message in the inbox- is good. J.K.: You deal with many things -writing, the radio, and translation-... what fulfils you more? Augustus Corto: All of them somehow quench my thirst - the radio for example my worship for music. I am an avid listener! I can listen to music for many hours a day, doing various other things, either housework or on my balcony. Other than that, translating and writing as well as reading are to me a keen love, apart from helping me make a living. There are stories and characters that I love as if they were real people in flesh and bones. J.K.: I am going to take you a while back in the early 2000, when you had one of your first TV appearances on V. Vasilikos show. What are your feelings from a meeting with a man so important in the field? Augustus Corto: V. Vasilikos, other than a sensational writer, is an incredibly generous man with a very big heart. In fact, my acquaintance with him has been a gift. And a second, inconceivable to me gift, was the fact that he read one of my books with tremendous care and tenderness, and I treasure a handwritten card he sent to me after reading Katerina’s book. He is a wonderful man and he has this generosity of a not merely whole man who has lived an exciting life and success, but of a deeply kind-hearted person. J.K.: Thank you very much for your time. Augustus Corto: Thank you too.